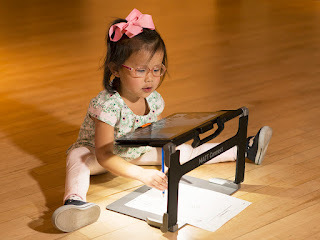 Our object this week is a new acquisition, donated by Mireille Duhen. Ms. Duhen works at the Association Valentin Haüy in Paris, and is constantly reminding me how many innovations in education for the blind had their roots in France. 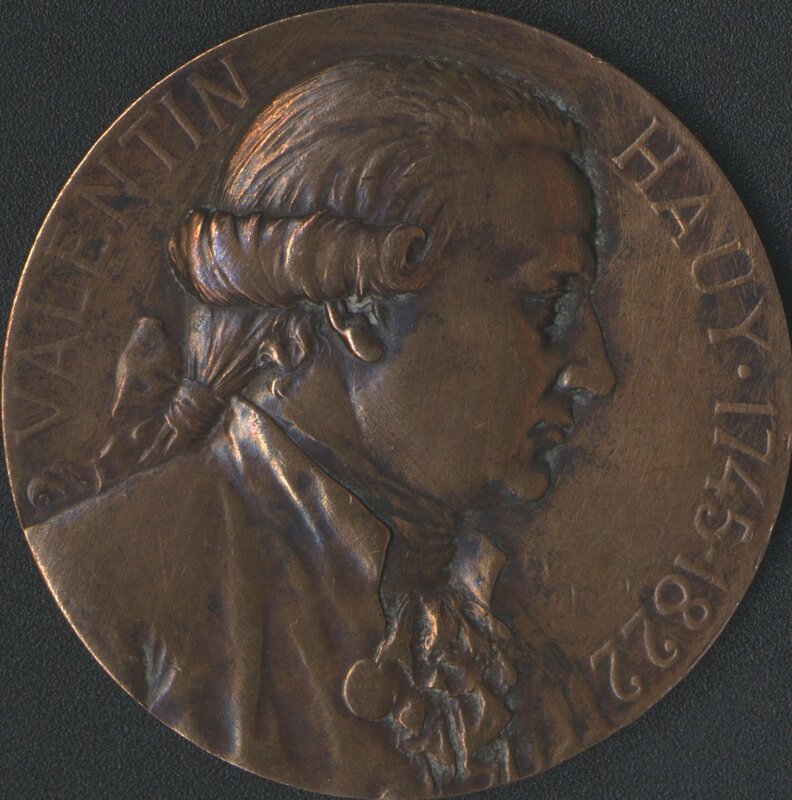 It is a commemorative medal, cast in bronze, remembering Dr. Valentin Haüy (1745-1822). It features his face in profile on the right, with his hair neatly pulled back into a pigtail tied with a bow and his sideburns curled. Dr. Haüy founded the first school for blind students in the world in Paris, France in 1784, the Institut Royale des Jeunes Aveugles . He also invented the tactile book. By the time the medal was made, the name had been changed to Institut National, reflecting the fall of the monarchy during the French Revolution This medal, sculpted by Frederic de Vernon, was completed in 1887. 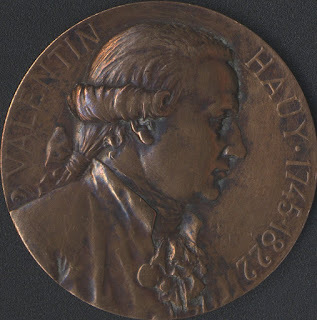 A rectangle left blank on the back of the medal allowed it to be used for various awards, in this instance the Prix Wilkins de Varney. The award was established at the school in 1857 for good character by a female student, and was awarded based upon a vote by students and teachers. There are examples of different medals being used for the award on the web over the years. We don’t know who Clotilde Liserta was, but it does personalize the medal a lot for me to imagine her proudly clutching it and surrounded by her admiring friends after receiving it in 1895.